Working our way through all full-sized routers we got our hands on the 5615-21, a member of Milwaukee's premier line of routers. Judging from the size of the box it arrived in we knew we were dealing with a serious tool. The 5615-21 even comes with a strap to keep your hand in place. Let's take a look if the BodyGrip the line is known for is worth getting excited over, or if it is just another gimmick. Everything about the 5615 series is heavy duty. There is metal everywhere; sometimes too much of it. What little plastic there is, is top quality. The base is very heavy. 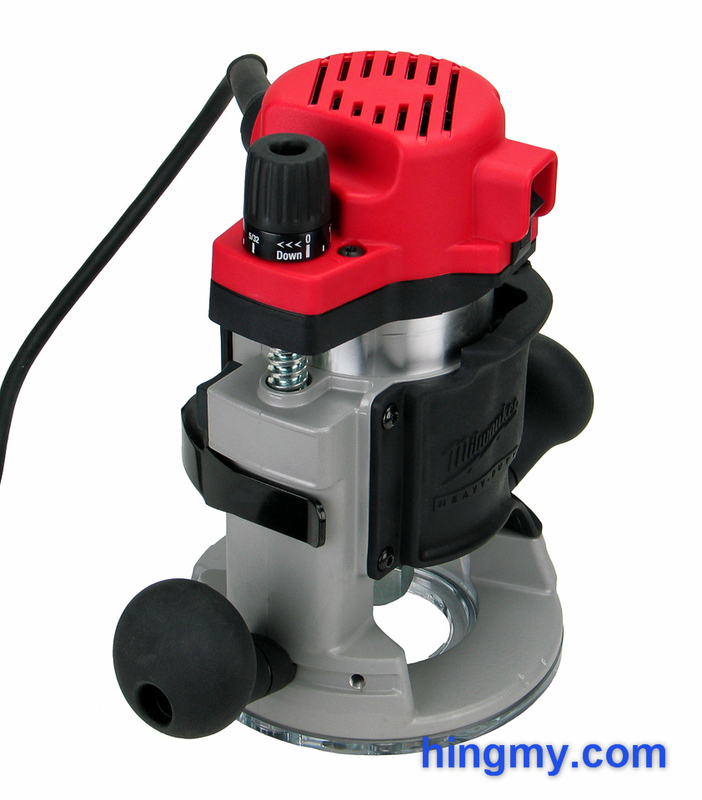 The all-metal casing of the depth adjustment mechanism gives the router a relatively high center of gravity. With the motor installed the unit feels heavier than most routers, both when carrying the router and when making cuts. All that metal, however, makes the 5615-21 a very durable router. The collet is somewhat peculiar. The collet nuts of the two collets are larger than any we have seen so far. The nut's size primarily helps when changing bits, but offers no more of a secure hold than a regular size collet nut does. The clear plastic base plate comes with a large opening. A small-opening base plate that provides added stability can be purchased separately. Guide bushings can be installed in both. The router gets it's BodyGrip designation from a rubber sleeve that wraps the router's lower base. The sleeve forms a rubber grip the user's dominant hand wraps around. The idea is that the router is easier to control with one hand as close to the center of gravity as possible. In practice the features takes some time to get used to. While being usable by both right and left-handed users, the grip cannot be called comfortable. You have to have average size male hands or larger to wrap your fingers around the body in the first place. Once they are there you are holding onto an extraordinarily heavy and powerful router with one hand. The wrist strap that holds your hand in place is neither reassuring, nor necessarily a good idea. Either way, the user has to be plenty strong to have a chance of using the router in this configuration. I see the BodyGrip idea as an innovation that will please some of use. For the rest of us there are still two perfectly good rubber handles in the traditional place to hold on to. One of the handles can be removed and reinstalled in a total of 3 position. The low attachment points of the handles make the otherwise very top heavy router easy to control. The 5615-21 can still be very tippy, especially when routing edge profiles, but the situation is manageable. The motor of the 5615 series is a fixed speed unit that spins the bit always at a constant 24,000 rpm. That's a good speed for most bits that fit into the base of the 5615-21, but not all. If you want variable speed you have to upgrade to the 5616 series. The 11 amp motor is plenty powerful for a fixed based router. In our cutting tests it powered through everything we threw at it with ease. The only issue we could find with it was the missing soft-start feature, which is a noticeable omission on such a large motor with such a large rotational mass. The router jerks on startup more than any other fixed based router we have tested. Starting the bit close to the work piece is out of the question. With care, however, you can work around this issue. The depth adjustment mechanism is another feature where Milwaukee dares to go into a different direction. A heavy duty screw attached to the motor controls the depth of the unit. The screw connects with threads in the base when the motor unit is inserted. Simply turning the screw moves the router up and down. A scale built into the lower half of the adjustment knob allows the motor to be repositioned with ~1/256th of an inch of accuracy. 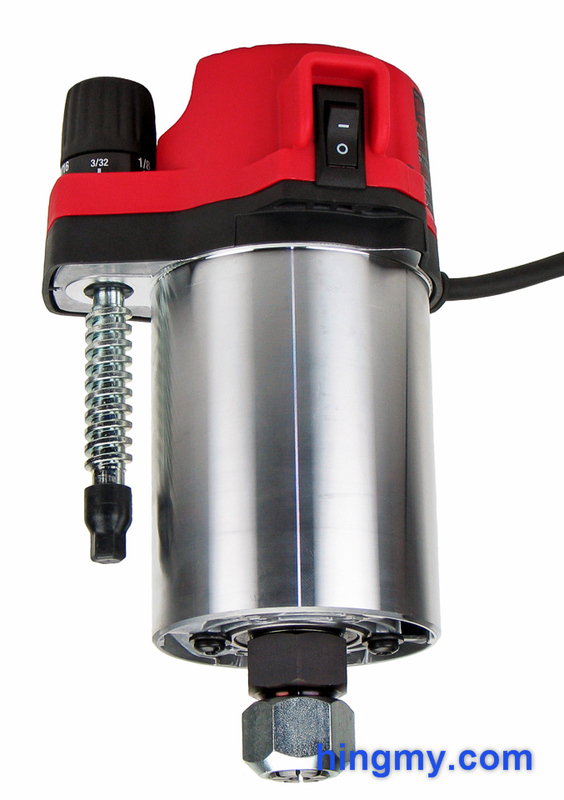 A sturdy quick-release button allows the motor to be removed or repositioned by a in large increment. The true value of this design becomes apparent when the motor unit is installed in the optional plunge base. In this configuration the same screw controls the depth stop. The scale now allows the rod to be positioned with an accuracy not available on other routers. When installed in a router table the depth adjustment mechanism works equally well. A special T-handle socket wrench connect to the screw from above the table through a hole in the base plate allowing the bit's depth to be adjusted from above the table. This is one of the best solutions on the market. On the fixed base model the motor is held in place with a large motor clamp. Following the split base design, the clamp compresses the walls of the base to fix the motor in place. Like most design of this nature the motor moves ever so slightly when the clamp is closed. Unless the user is careless on the 5615-21 this movement is below the required accuracy level of woodworking. Measuring a second time after the motor is locked into place nevertheless remains the prudent choice as the system is not foolproof. The case is as heavy duty as they come. It is made from vacuum formed plastic. Double walls all around the case give it remarkable strength. All the accessories that fit the router, if they are part of the kit or not, are securely clipped into recesses along the case walls. Everything has its place. The RouterStation feature advertised by Milwaukee is a little misleading. It's not all a feature that allows the case to be used as a router table. The RouterStation is merely a place the router is stored in after a day of work. Milwaukee wants us to bolt the router case to a bench top in our shop. The walls of the case open sideways to allow easy access. A deep recess below the spindle allows the router to be put away with the bit still in place. All of this certainly provides value, but not to everyone. If you do not want the case, consider the 5615-20, which comes in a cardboard box. As a case for transporting the router to a job site, Milwaukee's solution works well. The case is sturdy enough to withstand years of abuse all while keeping your router safe. On the negative side the case is too big for what is inside of it making it unnecessarily unwieldy. Not having their own line of stackable storage boxes hurts Milwaukee here. Without a dust extractor connected to the router dust management is excellent (but dust collection is non-existent). The motor generates a powerful downward jet of exhaust air that blows any chips away from the cutting area and, more importantly, the air intake of the motor. This makes the router a dust launcher. If you run this router in your shop without an extractor, be prepared to clean not only your workbench, but also a few feet beyond it. The included dust shroud installs in about a minute. It is held in place by a metal bar that slots into the guide rod holes in the base. A screwdriver is needed to loosen and re-tighten two set-crews, which are accessible from below. In this configuration dust collection performance improves dramatically. Collection above the bit reaches a near perfect level. The router still ejects a good amount of dust below the bit, if the bit is open to air. The extra large collet seems to be blocking the airflow. The 5615-21 is less efficient at collecting dust than its immediate competitors from Bosch and DeWalt. Milwaukee offers two different lines in their BodyGrip Series. The 5615 series comes with a fixed speed motor, while the 5616 has a slightly more powerful unit with variable speed. The different bases, accessories, and cases are identical between the two lines. As it often is with routers, the kit versions are a better value. In the shop the 5615 is a beast of a router. It'll chew through wood, but it'll also let you know that you are working with it. Our performance test proved that the 5615 can work all day long. It's duty cycle allows for almost continuous use. Unless you are running molding at production speeds through a router table the 5615 will not quit on you. In a router table the slightly more powerful motor of the 5616 series would be preferable. Unless you are in a hurry, you'll never notice the difference. During handheld operation the powerful motor combined with the high speed of rotation put any discussion about routing speed out of mind. The 5615-21's performance is not determined by the horse power below its little red motor cover; it is determined by the way it handles. The router's weight is noticeable when getting it ready for a cut. You know that you are holding on to something powerful. During the cut the weight keeps the router stable, but also prevents it from being truly agile. Too much of the router's mass sits high above the base plate. If the user is not careful the router can easily tip or go where it should not. All of this adds up to a good, but not great experience. The 5615-21 clearly provides everything you'd need from a router, but it does not manage to create that feeling of effortlessness that comes from working with a truly great tool. 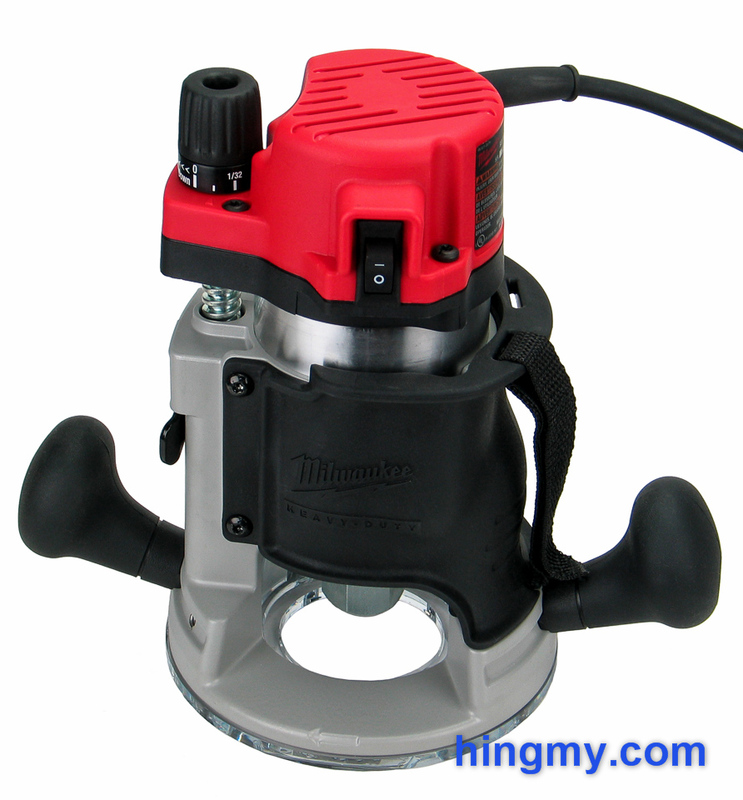 In the market of full-size routers the Milwaukee, along with the DeWalt and Bosch, have the distinct advantage of being part of a router system. Being able to slot the motor unit into a different base can be valuable, especially when the motor unit and the accessories built around it are of high quality. The variable speed units from all manufacturers are more powerful and expensive than the fixed speed versions. The 5615-21 is a brute among full-size routers. A metal body with very little plastic make this router heavier than most. The innovative BodyGrip entices the user to control all that power by wrapping a hand around the body of the router instead of using the traditional handles. The method works well, but cannot be called a necessary feature that all routers should have. The innovative depth adjustment knob, however, is among the best on the market. It works well in the fixed base, provides unrivaled accuracy in the plunge base, and is adjustable from above the table in a router table setup. Overall the 5615-21 is a solid router that shows a lack of attention to the finer points of design. It is heavier than it needs to be and unnecessarily top heavy. Some components are plain over engineered. What's left is a router as indestructible as any, but lacks the refinement that makes it special.